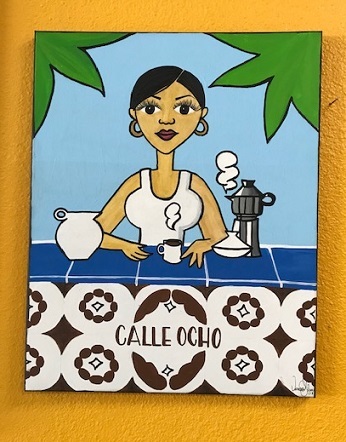 I heard about Calle Ocho from our Dine 909 columnist, who tweeted a mention of it a few weeks ago. 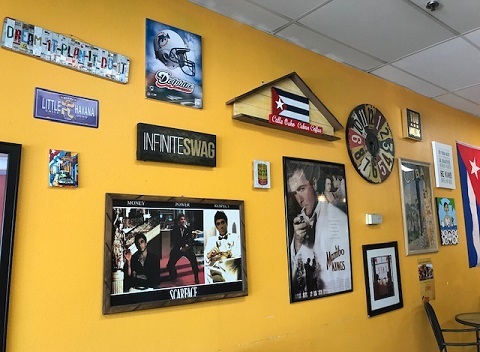 Interesting that that would make two Cuban eateries in the same center, which is half automotive shops (and half, it sometimes feels like, businesses to patronize while your car is being smogged). Not long afterward, I pulled into the center just above the railroad tracks with an eye toward eating again at Mica’s, the other Cuban spot, while taking a peek at Calle Ocho for future reference. But Mica’s was “closed for remodeling,” which often means a change of ownership. So I stepped into Calle Ocho. 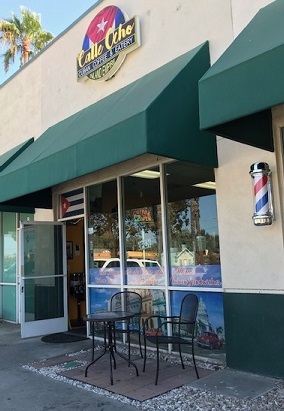 The owner, or maybe co-owner, who was seated at one of the two small glass-topped tables, immediately greeted me and moved behind the counter. The menu is small: a few sandwiches, empanadas and coffees, including cafe con leche, some sides and some breakfast items. There’s a counter with a few more seats by the open kitchen. 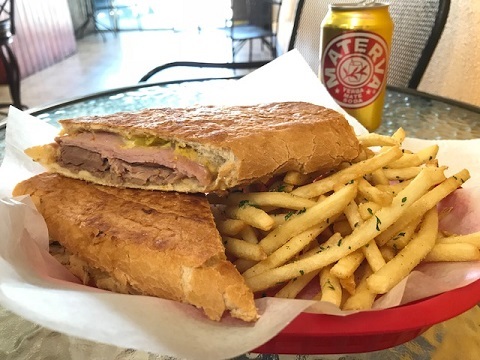 I ordered the mainstay sandwich, the Cuban ($11), with roast pork, ham, Swiss, pickles and mustard, plus garlic fries and a Materva soda. Probably 15 minutes later, the sandwich was delivered. This was an excellent sandwich, with the tender pork a standout. Very filling too. The Cuban soda was like a less intense Inka soda. “You’re lucky you came in at this time,” the woman had told me after I ordered, which was around 1:30 p.m. “At lunch sometimes people have to wait 45 minutes for their food!” Prepare accordingly, or phone in your order to (909) 560-2925. Also, note that they’re open only five hours a day. 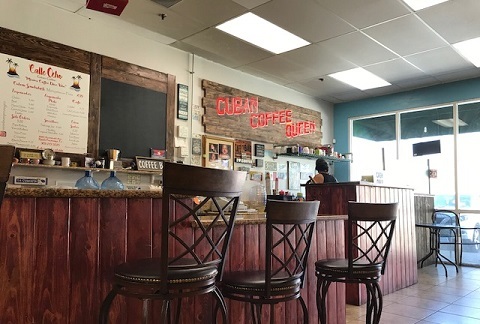 This entry was posted in Restaurants: Rancho Cucamonga and tagged coffee, Cuban, Rancho Cucamonga, restaurants by David Allen. Bookmark the permalink. Calle Ocho has an amazing welcoming feel. When you walk in your greeted as if you were family. Number one in hospitality and the food is BOMB. Love this place and the workers. Everyone should try this spot. It is a hidden gem.